Cover and padding. Enquire if the board comes with the paddings and if the padding is thick. Also, consider the type of material and if it is smooth. Extra features. Essential features that you should consider are a frame, height adjustability and the kind of board top. This Britania Iron Board is the folding type with an extra-large board. It can accommodate linens, sheets and larger pieces of cloth. Its height is adjustable; so do not worry about your height and it is easy to set up. At the end of the rack, there is a section where you can hang shirts and pants. However, because of its size, it is not easily portable. But if you are using it one place only, you will be okay with it. It is well build to ensure that it is stable. It is one of the most loved ironing boards. When you want an ironing board with a large top, then consider this Household Essential unit. This iron board is the folding type, so you do not have to worry about space in your room. It is has a wide board, measuring 18 x 49 inches. It is the best when you are doing large ironing, such as linens and long pants. Its height is adjustable, so you will be able to fix it at to your preferred height for precision. It is easy to store because you just need to fold it. 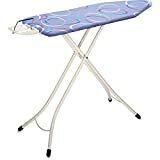 Another unique ironing board is this Household Essential Unit. It is a replacement of the full-size ironing space. It measures 12 x 30 inches. So when you have no space in your house, this is the best product. You can fold the board stands, as well as the tabletop. 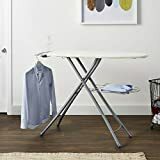 Despite lacking an iron rest place, it is affordable, easy to set and a solid ironing board. Without a doubt, this is a unique ironing board with features that are rare on other boards. It scores high in its design, features and quality. Its stands are foldable, has a multi-layer cover, retractable iron rest, ShoulderWing system and heat resistant tray. However, to get it you have to pay more, but it is worth. This is another stylish and good quality ironing board that comes with extra features. It is the best when your ironing load is always high. It has an iron rest place and a special space underneath the board where you can place the clothes that you have already ironed. It is easy to store because all its parts are foldable or retractable. 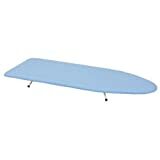 It is well built and stable and can support a higher weight than other ironing boards.